Bela Lugosi's interpretation of the Count is a horror classic and his influence still felt in the portrayal of vampires on screen to this day. 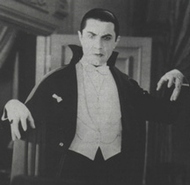 In 2000 the US Library of Congress declared 'Dracula' - the 1931 version starring Bela Lugosi and directed by Tod Browning to be "culturally significant". It was selected for preservation in the National Film Registry. As of 2006 it's been estimated (presumably by someone who'd know) that 170 films have been made in which Dracula appears in a major role. Lugosi's Dracula wasn't the first significant film adaptation of Bram Stoker's story. In 1922, silent film director F.W. Murnau made a movie called Nosferatu: eine Symphonie des Grauens ('Nosferatu: A Symphony of Horror'), which took the story of Dracula and set it in Transylvania and Germany. Murnau's version highlighted the animalistic in the vampire as opposed to the seductiveness of Browning's suave Count. 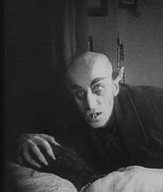 In 'Nosferatu', Dracula's role was changed to that of Count Orlok, one of the most hideous versions of the vampire ever to be created for a movie, played by Max Schreck (whose name literally means 'fright'). Despite Murnau's alteration of names and places in his film, the Stoker estate filed and won a lawsuit for copyright infringement. All existing prints of Nosferatu were ordered to be destroyed. However, a number of pirated copies of the movie survived to the present era, where they entered the public domain. Nosferatu was also remade in 1979 by Werner Herzog.